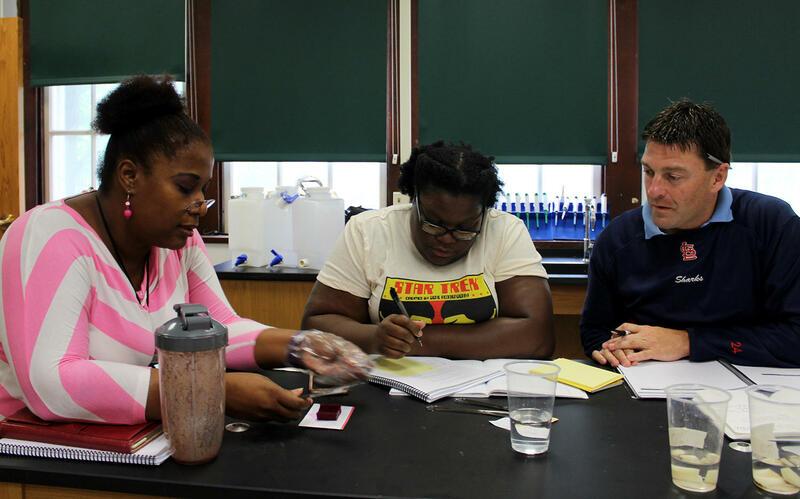 St. Louis Public Schools science teachers Ninfa Matiase, LaJuana Stidmon and Jeremy Resmann practice an experiment in August, 2016. The district is considering adopting a teacher residency training program to improve teacher retention. Within five years of being in a St. Louis Public Schools classroom, nearly half of teachers leave the district. Now SLPS is considering adopting the St. Louis Teacher Residency Program in an effort to retain new teachers. Recruits would spend a full school year embedded in a classroom shadowing an experienced teacher while also earning their teaching certificate. The program’s founder, Laura Vilines, taught in St. Louis a decade ago before leaving for graduate school and then to teach in another state. “I think I had a similar first year of teaching that many people have where you feel like you’re trying to figure everything out all at once,” she said. Vilines plans to start with a group of 30 new teachers and scale up to 90 by year five. St. Louis Public Schools’ Special Administrative Board is scheduled to vote on a one-year, $80,000 contract with the St. Louis Teacher Residency Program at its March meeting. University City School District and KIPP St. Louis, a charter school network operating in St. Louis, are also considering joining. Teacher residency programs, which already operate in more than two dozen other cities across the country, place interested teachers in a classroom as understudies to experienced mentor teachers. They’re in classrooms four days a week and on day five work on earning a teacher certification. Once their residency and certification is complete, they commit to teaching in the district for at least three years. Teaching in high poverty urban schools comes with added challenges that can burn teachers out quickly. “They need to understand with eyes wide open what kind of challenges they’re going to have and it’s our job to try to make them aware of that and support them prior to them coming to us,” said Kelvin Adams, superintendent of St. Louis Public Schools. SLPS is also a part of Teach For America, which takes recent college graduates and places them in needy schools for two years after a four week summer training program. Adams is not against the Teach For America model but said a residency program offers new teachers a “longer runway” of preparation. Fifteen percent of first-year teachers in St. Louis don’t come back, according to Haliday Douglas, a district administrator. While that’s in line with the state average, retention worsens as years go on. Just under half of teachers stay in SLPS more than five years, according to Douglas. That compares with 70 percent of former residents in cities with the program stay more than five years, according to the National Center for Teacher Residencies. Kansas City Teacher Residency is its second year. It had 34 residents its first school year, of which 32 are still teaching, according to founder and executive director Charles King. Four in ten are persons of color and almost a third are male, King said, which is more diverse than the national average for teachers. 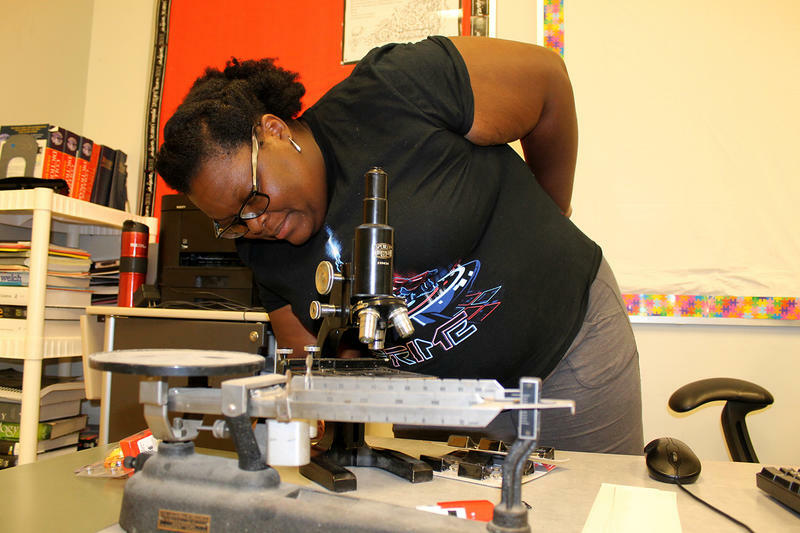 In its Teacher Preparation Report Card, the Tennessee State Board of Education gave Memphis Teacher Residency an overall high score of 4, ranking it above some four-year education colleges but slightly worse than Teach For America. What keeps St. Louis teachers returning to the classroom? Comparatively low pay. Long hours. High — and often changing — expectations. A sometimes reluctant audience. Two months of vacation isn’t a big enough perk to lure anyone into the teaching profession for long. So what inspires St. Louis teachers to return each year? With most St. Louis area schools now back in session, St. Louis Public Radio asked local teachers what keeps them coming back, what are their biggest challenges and what advice they have for parents.